This guide provides access to health resources that are available as streaming video, as interactive online, or as stand alone DVD. 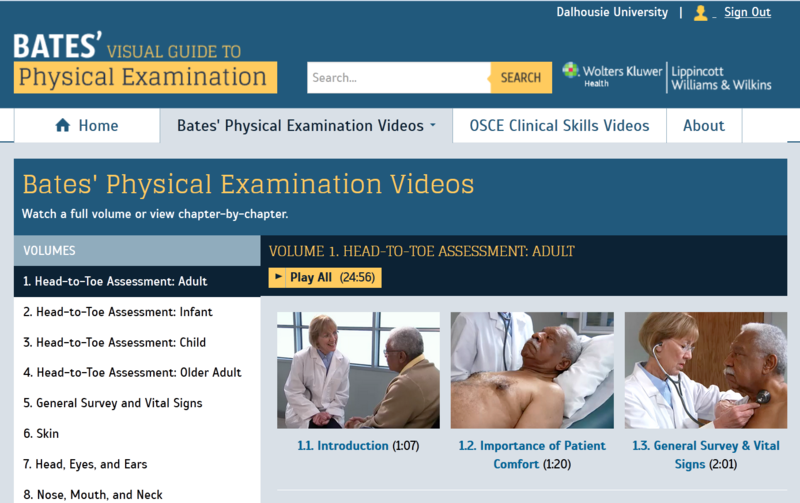 Now in its 5th edition, Bates' Physical Examination videos feature completely reshot content, and delivers head-to-toe and systems-based physical examination techniques for all health professionals. The site features more than 8 hours of video content. For permanent links to one of the individual modules in Bates go to our Physical Examination tab. PLEASE NOTE: Dalhousie's subscription does NOT include the OSCE clinical skills videos. Welcome to the Kellogg Library's media resources page. This is a page to collect and show off our media collections! Click here to browse our DVDs. We also have links to a variety of video downloads and image resources. We welcome suggestions for new content and improvements to the guide itself. The Kellogg Health Sciences Library has access to a range of video and image sources. This guide offers a selection of some our our major sources. Any streaming video from National Film Board "Screening Room" can be screened in Dalhousie classrooms. Visit this link to explore available films by Subject, Director or Title. Note that there may be an access fee for some films, for example those marked with "Partner".